Inbox: This a shared inbox available to all Sentle users within your organisation where they are able to view all emails. 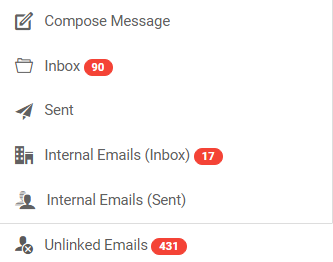 The emails that show up in this inbox will be linked to a contact within your system. 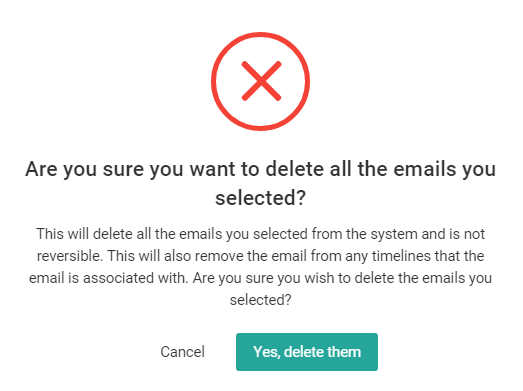 Please note: when deleting emails directly from the inbox they will also be removed from the associated contact's timeline. The following warning will be displayed in this scenario. Sent: All emails that have been sent from your individual Sentle account. Internal Emails (inbox): These are all emails that have been sent to you from colleagues. Emails can be deleted from this folder. Internal Emails (sent): All emails that have been sent to colleagues. Email Account Folders: eg bob.smith@sentle.co.uk. This will contain all emails sent directly to you and will contain a mixture of linked and unlinked emails.